The 'Orkneyinga Saga' tells of the powerful Kolbein Hruga, who has become the Giant "Cubbie Roo" of local folklore. He lived on Wyre in the 12th Century and his stronghold Cubbie Roo's Castle stands to the north-west of St. Mary's Chapel. Cubbie Roo's Castle is believed to be the oldest stone castle in Scotland. 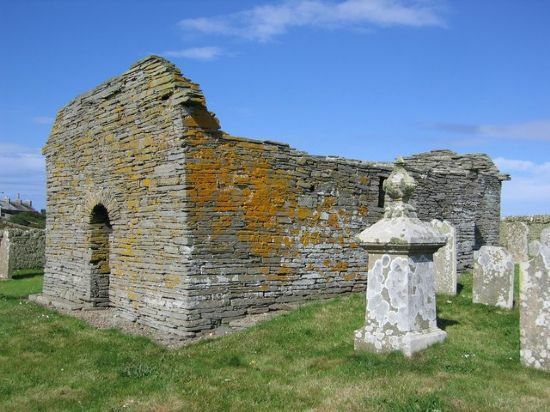 Also known as St. Peter's Kirk, St. Mary's Chapel was founded in the middle of the 12th Century by either Kolbein Hruga or his son, Bjarni Kolbeinson, the Bishop of Orkney. General Traill-Burroughs partly rebuilt the Chapel in the late 19th Century.